As the month-long Indian national election begins this week, the use of social media and technology to get out the vote is an important part of the political parties’ strategy in vying for power. But even as India embraces technology in increasing numbers, only a small portion of its 1.2 billion people have access to the internet. 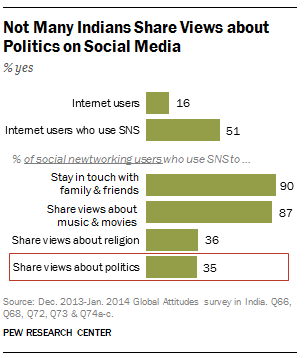 And while about half of Indian internet users regularly access social networking sites, only about a third of these users share views about politics via social media. Overall, only 16% of Indians say that they use the internet at least occasionally or own a smartphone. Of these internet users, 51% say they use social networking sites such as Facebook, Orkut and Twitter. Once Indians are on a social network, they tend to use them for staying in touch with family and friends (90% of social networking users) and sharing views about music and movies (87%). They do not use these sites as often for sharing views about politics (35%). However, we’ve found similar patterns among other emerging and developing nations. While internet access is lagging in India, cell phone usage is much more prevalent, with 77% of the population owning a mobile device. About half of Indians who own a cell phone use them to send text messages, but only 37% use the devices to take pictures or video. 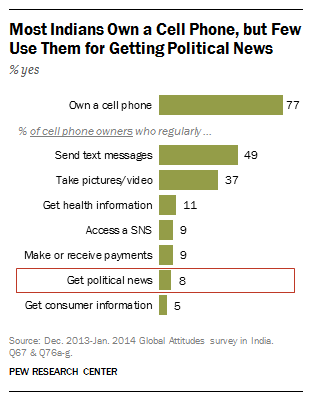 Even smaller shares of mobile phone owners use the devices to access a social networking site (9%) or to get political news and information (8%). These figures are well below the median percentages that we found in other emerging and developing countries. Still, the technology market in India is booming as the country becomes more of a regional and global economic player. Assuming the Indian economy continues to grow over time, technology companies will have an increasing number of Indian consumers. And it is likely that these technologies will become more integrated into the vast democratic process of an Indian election. Pew Research Center survey on technology usage in India was conducted between December 7, 2013, and January 12, 2014 (for more details, see the methodology from Indians Reflect on Their Country & the World, released March 31, 2014).